Recently Chris Harrold, Vice President of Business Development/Creative Director at Mohawk, invited me to up to the Albany/Troy area to see the Strathmore Archives that he has been digging into for the past few months. I was lured by the promise of seeing unknown work by W.A. Dwiggins and by the opportunity to do some preparation for my upcoming talk on “W.A. Dwiggins and the Promotion of Paper 1915–1935” at the Type Directors Club on June 3*. For months both Dan Rhatigan of Monotype and Chris have been telling me juicy tales about the material laying in wait in the Strathmore Archives so I was more than eager to see what there was for myself. It turned out that there was no mountain of Dwiggins items; and what there was I had already seen in several other archives and libraries since 2006. Yet, the trip was still extremely valuable and certainly great fun. I am already looking forward to a second visit in the next few weeks. 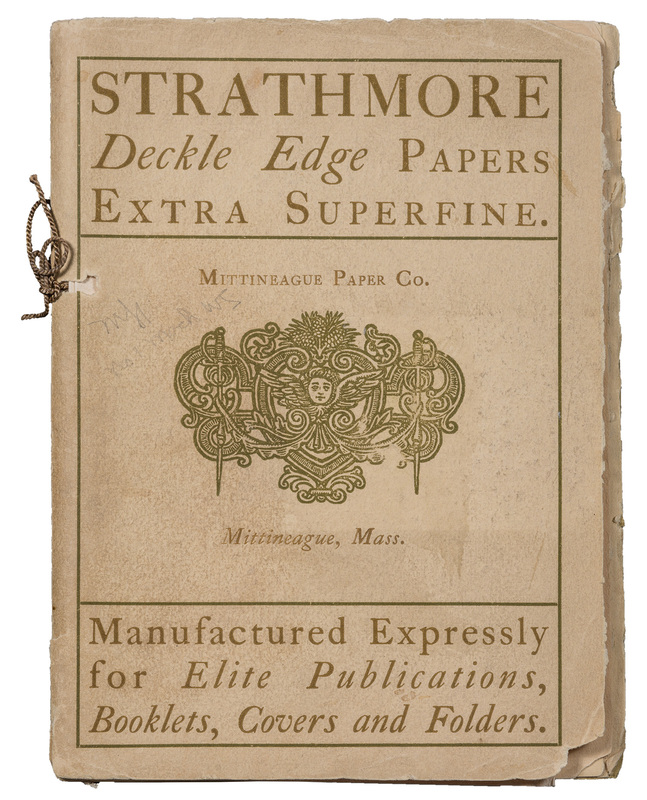 When Mohawk Papers acquired Strathmore Paper from International Paper in 2oo5 it also inherited the latter’s extremely rich trove of historical material. The archives languished in a Mohawk warehouse at the Port of Albany for a decade until Chris, spurred by Mohawk’s participation in Century, the recently-opened exhibition at the AIGA National Design Center, started to rummage around. This was not as easy as it seems since the Strathmore Archives are, at this point, a huge quantity—the exact number is not known—of large cardboard boxes, most of them unmarked or incorrectly marked as to their contents, piled up on skids and wrapped in plastic. “Paper as Color: A Demonstration from Wood Blocks.” (1923) Design and illustrations by Adolph Treidler. Part of the “Paper Is Part of the Picture” campaign. This is a detail from one of the scrapbooks in the Strathmore Archive chronicling the various elements of each paper promotion. When I ﬁnally showed up last Thursday Chris had already gone through a number of boxes and pulled things out for Century. Duplicates of some of the items on display at AIGA and additional items exhibited had been laid out for me to see on a series of tables in a conference room at Mohawk’s headquarters in Cohoes, New York. I didn’t know what to look at ﬁrst. Chris was so excited about so many different items that he kept directing my attention one way and then another and then another. On one table there were booklets by Dwiggins, Oz Cooper, Fred Cooper, Walter Dorwin Teague, Helen Dryden, the Rosa Brothers, George Trenholm, C.B. Falls, Adolph Treidler and others. On another table there were sample books by Will Bradley, T.B. Hapgood, Hal Marchbanks and other unidentiﬁed designers. And elsewhere there was promotional material by Lucian Bernhard, Susanne Suba, and a copy of A Grammar of Color designed by T.M. Cleland—the most lavish and important of all Strathmore publications. It may be a cliché, but I felt like a kid in a candy store. It took me awhile to catch my breath and to ﬁgure out a strategy for looking at the various items, taking photographs, making notes, and answering as many of Chris’ questions as I could. But as I looked at what was in that room I began to realize exactly how important Strathmore had been to the development of the nascent graphic design profession in this country. It was the ﬁrst paper company to see the value of employing designers when it hired Will Bradley in 1898 to design sample books of its deckle edge papers. 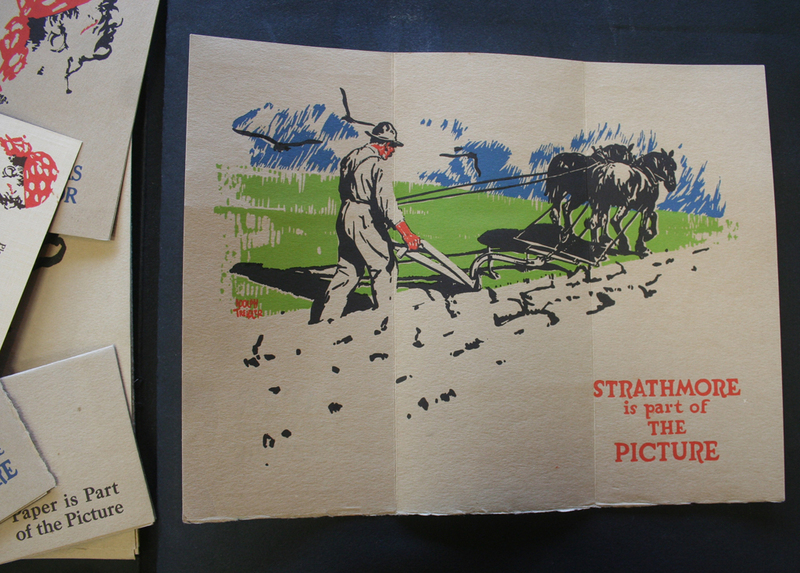 By the 1920s Strathmore had gathered a coterie of designers and illustrators as its close collaborators for a series of promotional campaigns—most notably “Paper Is Part of the Picture” and “Strathmore Town”—aimed at convincing printers not only to use more paper but to explain to their customers the value of paper as part of printing. Detail of “Paper Is Part of the Picture” (1922) promotion designed and illustrated by T.M. Cleland. The promotion folds out on both sides. 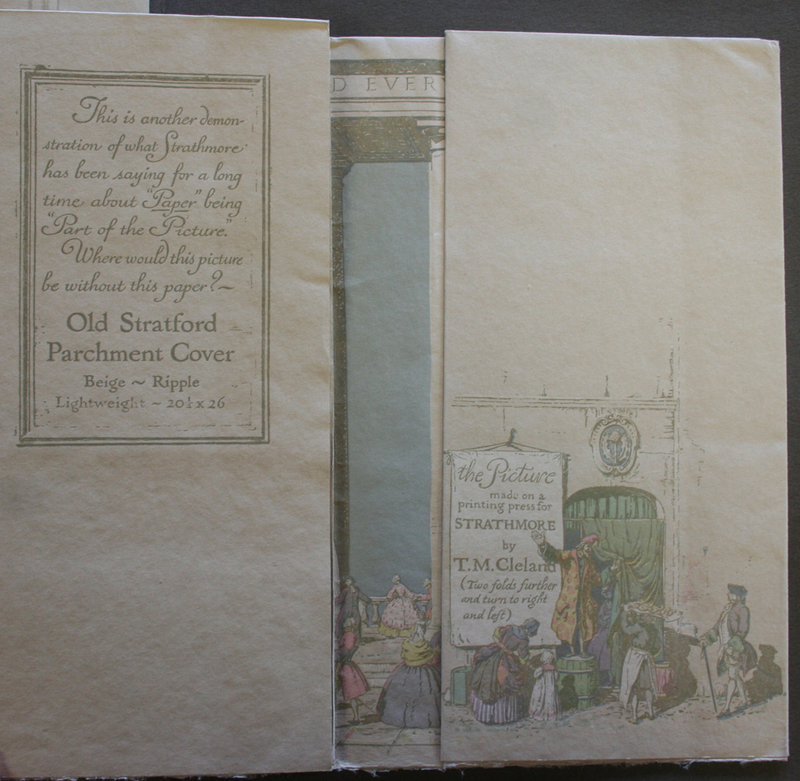 Detail from back of above promotion by Cleland explaining its production. A whopping 18 colors were used. 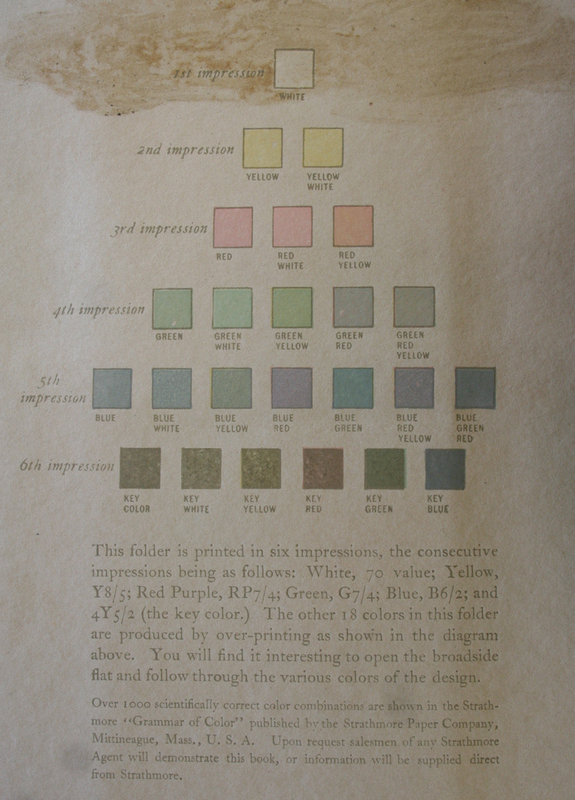 This was part of Strathmore’s demonstration of the value of its book A Grammar of Color (1921). Most of the designers and artists listed above participated in these two campaigns. Only a few of their names are familiar today—though not for advertising work such as this. Others who played a role in “Paper Is Part of the Picture” or Strathmore Town—such as George Illian, E.A. Wilson, Ralph Barton, R.F. Heinrich, Carlton D. Ellinger, E.G. Davenport and Winifred Murphy—are even more obscure. But all of them were well known within the printing and advertising trades at the time. Their work for Strathmore Paper—and for other companies in the arena of advertising between 1900 and the onset of World War II—constitutes the untold history of American graphic design. Although touched by the English Arts & Crafts movement of the 1890s, this work lies outside the private press vogue and its focus on handicraft. It is also oblivious to the “New Typography” in Germany in the 1920s, though it belatedly incorporates visual ideas from French Art Deco. 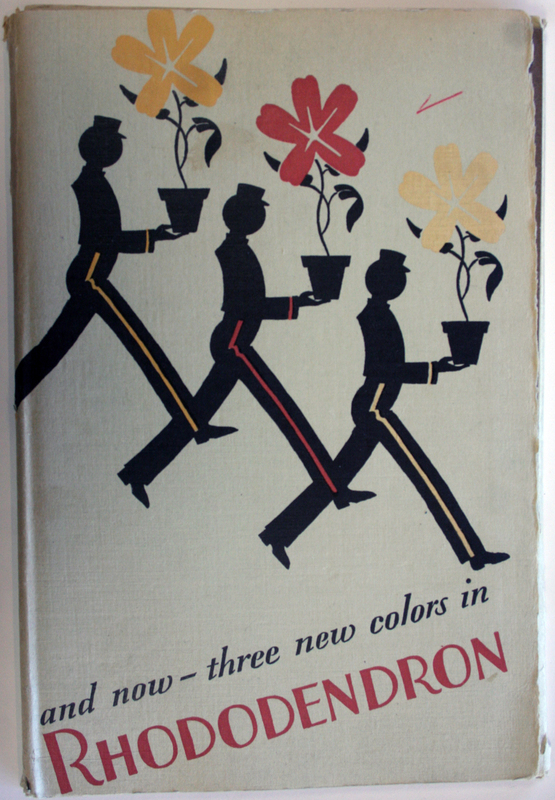 Strathmore Rhododendron Cover sample book cover (early 1930s). Designer unknown. The Strathmore Archives that have lain fallow for so long—there are still many unopened boxes in the Port of Albany warehouse—are providing a window into the ordinary world of graphic design in America that is not a part of the histories. There have been two dominant narratives of 20th century American graphic design: one that has focused on the book trade and type design (but only on text types), primarily from 1895 to the mid-1950s; and the other that has emphasized modernism from its early appearances in the 1930s, spurred by European émigrés, through its heyday in the 1970s. But the Strathmore Archives—and the surviving but scattered material from other American papermakers—are central to the story of how the American printing industry radically changed in the early decades of the 20th century. The change was not due to the Arts & Crafts movement but to pressure from the swiftly growing advertising industry and the relentless pace of technological development. The papermakers, with Strathmore at the forefront, worked to help printers adapt to modern economic conditions. It was in their interests as much as it was in the interests of the printers. *part of Century Expanded: Talks and Workshops about 100 Years of Type in Design sponsored by Monotype. The ﬁrst talk, held last night, was “The Centaur Type at Monotype” by Jerry Kelly. Rhatigan will be speaking on “Gill Sans after Gill” on May 28. A big thanks to Chris Harrold for allowing me to see the Strathmore Archives and to take photographs. And to Dan Rhatigan for introducing me to Chris.